To set the scene, First Round is a conference where branding agencies share their initial logo presentation that they pitched to their client. This is a very vulnerable thing to do. Showing other designers your process is risky, because what if people stole aspects of what makes your presentations unique? What if your process gets copied? What if your work is exposed and exploited? First Round speakers did a beautiful job empowering their audience. Nothing was withheld, nothing was skipped over. I feel like now more than ever, designers are banding together to uplift one another by sharing tricks of the trade and truly being vulnerable about their creative process. As a creative, getting to learn from other people’s experience is the greatest gift. I firmly believe that this collaboration is pushing design to limits it’s never reached before. The best part of peeking into other creatives’ processes was realizing that there are so many different angles to pursue a branding project. There is no right or wrong way to create, there is only a right or wrong way for you to create. Learn from other people, and curate your process in a way that best works for you. Take in other people’s input, and always evaluate ways that you can improve the way you create. 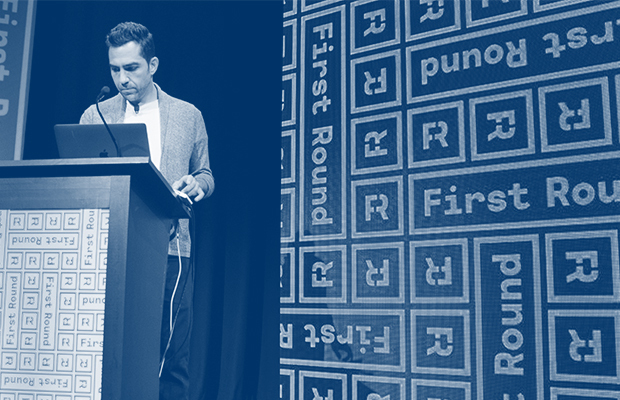 Ask questions, be vulnerable with the information you learned, empower this design community, and go to events like First Round. Do extensive research into your client’s competition. Determine how you can make your client stand out. Most companies show between 3-4 logo options in the first round. A few show only one. Every company at First Round showed in-application mockups. It help the client visualize how their brand can be expanded throughout collateral. Keep your client in the loop, and empower them to give honest, thorough feedback throughout every step of the creative process.